O’Shea Plumbing delivers another great outcome in this next case study. Early one morning, ‘Kelly-Anne’ (our Customer Service Representative) received a call from ‘Nicky’ (our new customer hailing from Wheelers Hill, VIC). Nicky was calling to request assistance with a blocked drain in her kitchen sink. Her attempts to clear the drain with the household product ‘Draino’ had been to no avail. Kelly-Anne promptly arranged for ‘Grant’, our experienced plumber to visit on-site later that morning. Grant provided some upfront quotes and suggestions to clear the blocked drain. However, upon further investigation, it was discovered that the drain under the house would require a higher degree of attention. Not only was it in very poor overall condition, but it also did not have anywhere near the correct gradient and was improperly connected to the main underground system! Grant outlined replacing the existing 65mm suspended drain under the house with a 100mm drain. Nicky happily accepted the associated quotes. The work involved installing the new drain with the correct gradient, installing expansion joints, clips, wall sleeves (to allow for pipe expansion through the brick walls) and venting (as specified in the regulation/standard AS/NZS3500). To go further into detail, a’ Ridgid Drain Camera’ and a ‘Ridgid Navitrack’ were used to locate the existing underground sewer drain. A new junction was cut into this drain to provide a proper connection between the suspended drain and the underground drain. In terms of site work, excavators were arranged, along with a bin to removed excess soil. Topsoil was provided to complete the ‘clean up of site’. In accordance with current regulation, a ‘Victorian Building Authority Certificate of Compliance’ was issued to authenticate the work in its entirety. This effectively ‘wrapped things up’, but the job did not stop there! 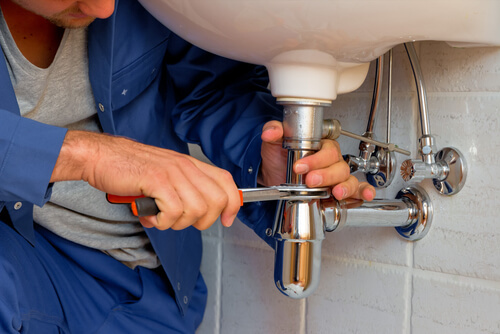 Feedback is so important to us at O’Shea Plumbing. So, we ensured that ‘Joanne’ (from our Accounts Department) contacted Nicky to make sure she was happy with our work. Nicky said she ‘was very satisfied’ and that both ‘Grant and Marco were very professional’. Overall, she was surprised that none of her previous plumbers had brought these issues to her attention and, all-in-all was so relieved to put all the inconvenience with her kitchen drain behind her!